Welcome to Februarys Peanut Butter Bash. This month we are bashing it up with crisps, or as my non British friends would say potato chips. No Bake Peanut Butter Chocolate Potato Chip Cookies is what I came up with. There is a billion of these recipes on the internet and they all seem to pretty much the same. So what makes this one different? 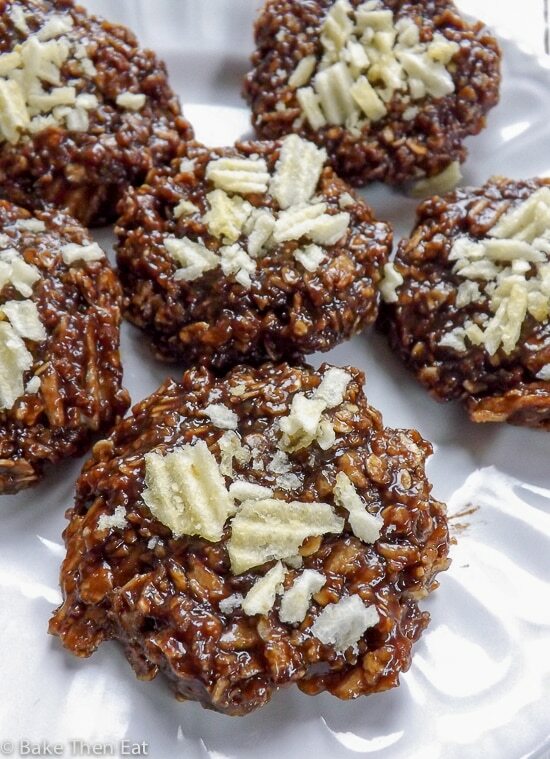 For me personally I just really like the ratio of chocolate to peanut butter and the crispy saltiness the potato chips brings to these no bake peanut butter chocolate potato chip cookies. As the title suggests the oven is not used in making these cookies, but there is a little stove top action going on here. Most of the ingredients and boiled in a pan over a high heat then the rest are added and cooled a little before being scooped into small cookies. Crushed potato chips sprinkled on top are completely optional but does add a lovely salty crunchiness to the cookie. The best way to make these cookies is to weigh / measure everything out first and have everything ready to go. Almost every one of the one billion recipes on line stated to use quick oats. In the UK there is no such thing as quick oats. We do have many microwavable oat breakfasts and I think this is what quick oats are. But to get around this I just measured out my oats using good old regular oats and pulsed them in my food processor 5 times for a few seconds at a time. 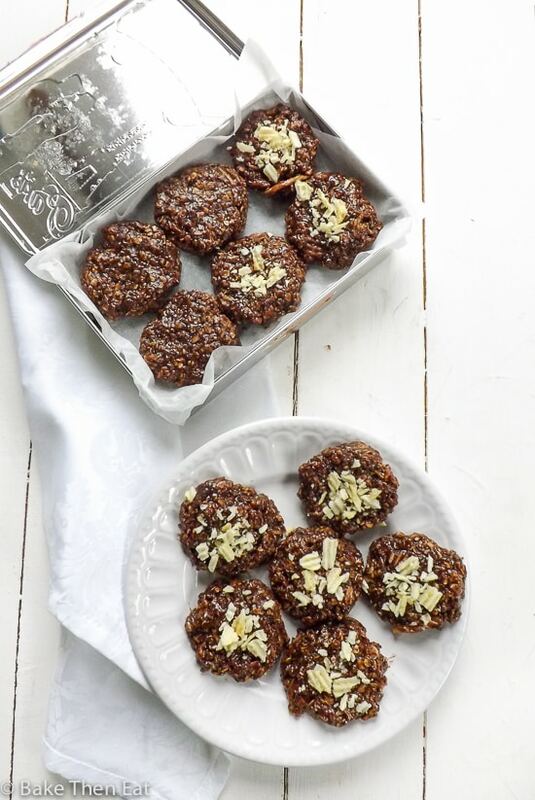 Hey presto quick oats  perfect for these no bake peanut butter chocolate potato chip cookies. Use a medium sized pan, because when the mixture is at a rolling boil it will rise up and we don’t want it to overflow in your saucepan and spill all over your stove top. First off we will melt the unsalted butter, sugar, milk and cocoa powder together. Once everything is melted we will bring it to a rolling boil and leave it for 60 seconds at the boil. Also don’t stir the mixture at this point, no matter how tempted you are. Then take it off the heat and stir in the peanut butter and vanilla extract. You then pour this mixture over your oats. Stir until everything is well combined and them leave the mixture for 5 minutes. I found this helps the oats to absorb the liquid fully. Just before scooping the cookies with a gentle hand fold in the crushed potato chips. Then spoon tablespoon sized scoops of the mixture onto a silicone baking mat or baking parchment and either place in the fridge for a few hours or the freezer for 30-45 minutes to enjoy quicker. Sprinkle extra potato chips on top if you wish to. These cookies need to be kept in the fridge and eaten within a week. These cookies can also be frozen for up to 3 months. 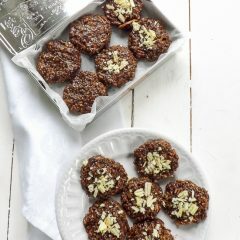 No Bake Peanut Butter Chocolate Potato Chip Cookies, give your oven a rest with these simple to put together no bake cookies. Packed full of oats, peanut butter and salted potato chips. The ultimate sweet and salty cookie. Measure out the crisps / potato chips and lightly crush them. Remember for those using cup measurements it is 1 cup once they are crushed not before. Then place to one side. Then measure out your oats and if like me you need to pulse them a little in your food processor to 'turn' them into quick oats then do this now. 4 to 5 pulses each lasting 2 to 3 seconds a blast should do it. Place to one side in a medium sized mixing bowl. In a medium sized saucepan add in your unsalted butter, sugar, milk and cocoa powder and lightly whisk it all together over a medium to high heat. Once everything is melted turn the heat to high and once the mixture hits a rolling boil, stop stirring and leave to boil on high for 60 seconds. Take the pan off the heat and add in the peanut butter and vanilla extract and stir until all is mixed together. Pour this all over the oats and stir until everything is well combined and leave for up to 5 minutes to give the oats a little time to absorb the liquid. Stir in the crushed potato chips with a gentle hand and using a tablespoon measure out scoops onto a silicone baking mat or baking parchment. Place in the fridge for a couple of hours or pop them in the freezer for 30-45 minutes until set and you are able to pick them up. Store these cookies in the fridge and consume within a week or keep these cookies in the freezer for up to 3 months. *If you don't have quick oats then just use regular oats and pulse them 4 to 5 times in your food processor for a few seconds at a time and this will chop the oats down in size so they become quick oats. *Any milk can be used I have made these with both cows and almond milk. *Use a shop bought peanut butter homemade or organic peanut butter will be too thin and oily. Do you want to join in the peanut butter bash fun? If you do, then leave a comment below saying you wish to join and we will get back to you. The deal is the first Thursday of each month we post a dish with peanut butter and one different ingredient to see what we can come up with. There is a Facebook group if you want to join in the fun but don’t have your own blog. The Peanut Butter Recipe Box. 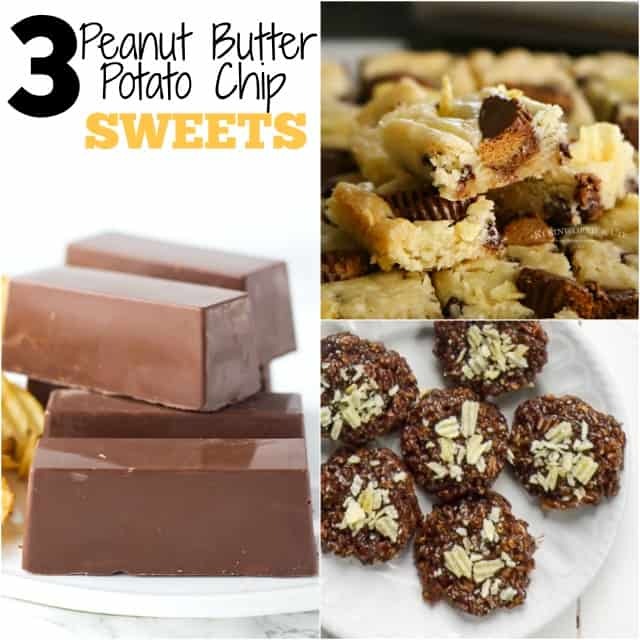 Here are the other peanut butter and potato chip dishes for you to enjoy along with my No Bake Peanut Butter Chocolate Potato Chip Cookies. Reese’s Potato Chip Cookie Bars from Kleinworth & Co.
What a fabulous idea of making peanut butter, chocolate and potato chip cookies. I would have never though potato chips might be used in a cookie. Cool. 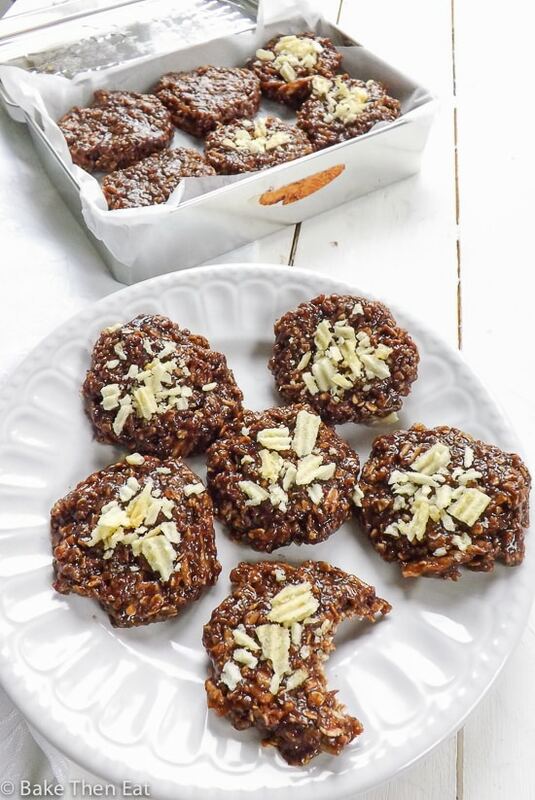 Your sweet and salty no-bakes sound amazing! I think they’d be even more addicting than chips!!! Droolllllllll!!!!! although I have never had potato chips with chocolate and peanut butter before – but I am sure my drool knows what it’s “talking” about LOL! This sounds like a really fun and delicious cookie recipe!